Gelbart's best known screen work is perhaps the screenplay for 1982's Tootsie, which he co-wrote with Murray Schisgal. He was nominated for an Academy Award for that script, and also was Oscar-nominated for his original screenplay for 1977's Oh, God! starring John Denver and George Burns. On his relationship with actor Dustin Hoffman in Tootsie, Gelbart is reported to have said, "Never get involved in a film where the Oscar-winning star is smaller than the statuette." He later retracted this statement, saying that it was just a joke. Gelbart's other Broadway credits include the musical City of Angels, which won him the Drama Desk Award for Outstanding Book of a Musical and an Edgar Award. He also wrote the Iran-contra satire Mastergate, as well as Sly Fox and a musical adaptation of the Preston Sturges movie Hail the Conquering Hero, whose grueling development inspired Gelbart to utter what evolved into the classic quip, "If Hitler is alive, I hope he's out of town with a musical." 1 2 McLellan, Dennis (2009-09-11). "'MASH' writer Larry Gelbart dies at 81". Los Angeles Times. Retrieved 2009-09-11. 1 2 Gelbart, Larry (1998). Laughing Matters: On Writing MASH, Tootsie, Oh, God!, and a Few Other Funny Things. New York: Random House. ISBN 0-679-42945-X. 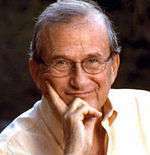 ↑ "Larry Gelbart dies at 81; 'MASH' writer - Los Angeles Times". Latimes.com. 1928-02-25. Retrieved 2014-07-04. ↑ Malarcher, Jay (2003). The Classically American Comedy of Larry Gelbart. Lanham, Md. : The Scarecrow Press. ISBN 0-8108-4772-8. ↑ See e.g. Barthel, Joan (February 25, 1968). "Life for Simon—-Not That Simple". The New York Times. p. D9. , cited in Popik, Barry (September 11, 2009). "If Hitler's still alive, I hope he's out of town with a musical (Larry Gelbart)". The Big Apple. Retrieved March 8, 2016. . According to Martin Gottfried, when producer Robert Whitehead tried to divert Gelbart by musing about how the ongoing war crimes trial of Adolf Eichmann might turn out, Gelbart shot back, "They ought to send him out of town with a musical." Gottfried, Martin (2003). All His Jazz: The Life and Death of Bob Fosse (2nd ed.). New York: Da Capo. p. 128. ISBN 978-0-306-81284-2. ↑ "Palm Springs Walk of Stars : Listed by Date Dedicated" (PDF). Palmspringswalkofstars.com. Retrieved 2014-07-04. ↑ "32nd Annual Theatre Hall of Fame Inductees Announced; Mamet, Channing, Grimes Among Names – Playbill.com". 209.183.229.132. Retrieved 2014-07-04. ↑ "Television Hall of Fame Honorees: Complete List". Emmys.com. Retrieved 2014-07-04. ↑ "'M-A-S-H' writer Larry Gelbart dies at 81". Associated Press. Retrieved 2009-09-11.